Yashwant Sinhas departure from the Bharatiya Janata Party (BJP) is an event which ranks as low on the political Richter scale as the entrances of S.M. Krishna or Rita Bahuguna Joshi in the saffron outfit from the Congress. All these individuals are has-beens in the political world whose comings and goings are of greater interest to themselves than to the general public. One reason for the latter's disinterest is that these departures and arrivals are not seen to be driven by ideological considerations, but by personal factors like ego which makes them look for new pastures to overcome the feeling of being neglected by their old parties. Age is another aspect, especially in the cases of Yashwant Sinha and S.M. Krishna. They can even be mocked on this count as Finance Minister Arun Jaitley did when he described Sinha as an 80-year-old job applicant when the former finance and external affairs minister of the Atal Behari Vajpayee government started criticising the party. Not surprisingly, the BJP has now lambasted Sinha for singing the Congress's tune. Ever since he started acting like a dissident along with Arun Shourie and Shatrughan Sinha, the trio has been seen as renegades although they were not expelled. It is possible that the step of eviction was not taken lest it allows them to pose as martyrs or because the party did not have the time to spare on those whom it did not consider important enough. Unlike Shourie and Shatrughan Sinha, Yashwant Sinha apparently did not like the idea of playing the in-house rebel for long, presumably because despite his protestations about adopting sanyas (monkhood) from party politics, he still hopes to play a notable role, albeit in the opposition camp, if only to prove that he is not "brain dead" which is how, according to him, the BJP regards all those above 75. Nor did he want to be relegated to the ranks of those in the so-called Margdarshak Mandal or purported visionaries like L.K. Advani and Murli Manohar Joshi, who have palpably been sidelined to play the role of mute and powerless observers. 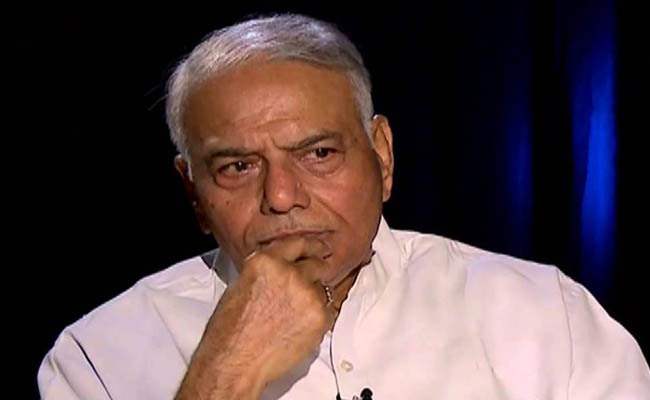 As Yashwant Sinha's latest step shows, he believes that he has enough of the political oomph in him to make an impact on public life by playing a meaningful role. What that role will be -- if any -- will only become clear with time. But, meanwhile, what can be expected of him is to add greater volume to the kind of discontent with the government which has been voiced by 49 former bureaucrats (a category to which Yashwant Sinha belongs as he was once in the IAS) and also by a group about 600 academics who have noticed a link between the violence against the minorities and the ruling dispensation. The academics have also endorsed what the former bureaucrats have said about the "terrifying state of affairs" in the country. These protests recall the decision of a section of writers, historians, scientists, filmmakers and others in 2015 to return the awards which they had once won in view of the prevailing atmosphere of "intolerance". Since these voices of dissatisfaction express the angst of a section of the middle class, Yashwant Sinha will not find much difficulty in mingling with the crowd of malcontents and even becoming a focal point of the demonstrations during the proposed nationwide campaign which he intends to launch to "save" democracy, as he has said. There is little doubt that he will be joined in this endeavour by the non-BJP parties of which several like the Congress, the Trinamool Congress, the Rashtriya Janata Dal (RJD), the Samajwadi Party, the Rashtriya Lok Dal, the Aam Admi Party and others were present in Patna when Yashwant Sinha announced his parting of ways from the BJP. Since he is an effective speaker, as are Shourie and Shatrughan Sinha, the BJP cannot but be a trifle wary if only because he will know some of the party's secrets as well as its ways of functioning. The BJP will also be on guard about the two others. If they, too, jump ship, it will not be good publicity for the party even if it dismisses them as opportunists who are unhappy about not having been accommodated in the government. The party will also be cautious about Sinha's subterranean lines of communication with the other senior citizens in the Margdarshak Mandal who cannot be too pleased about their marginalisation. Outside the party and its few restive members, there is the Shiv Sena, which is unlikely to lose any opportunity to take a dig at the drip-drip of desertions from the BJP of a former member as well as former allies like the Telugu Desam Party and the presumed unhappiness of Janata Dal (United) over the 200-odd communal incidents that have taken place in Bihar ever since Nitish Kumar switched his allegiance from the RJD and Congress to the BJP. For the moment, Yashwant Sinha's revolt may look like a storm in a tea cup. But no one can say what impact his teaming up with the BJP's opponents will have on the political scene, especially if the election results -- in Karnataka, for instance -- do not go the BJP's way.